For eighth consecutive year the Bulgarian Construction Chamber (BCC), Bulgarian Water Association (BWA) and „Stroitel“ Newspaper brought together the experts from the sector of Water Supply and Sewerage Systems at a National Conference entitled Operational Programme „Environment” and the Rural Development Programme per the period 2014 – 2020“. The forum was held in the Sredetz Hall, Sofia Hotel Balkan. The event was hosted by Eng. Iliyan Terziev, Chairman of the Management Board (MB) of BCC and Eng. Ivan Ivanov, Chairman of the MB of BWA. The conference was opened by Atanaska Nikolova, Deputy Minister of Environment and Water, Dr. Lozana Vasileva, Deputy Minister of Agriculture, Food and Forestry, and the Mayor of Sofia Yordanka Fandakova. In the Opening Panel participated as well the Director General of the Operational Programme „Environment” Directorate General within the MoEW Valeriya Kalcheva. Among the guests were the Deputy Chairman of the Parliamentary Committee on Transport, Information Technology and Communications – Stanislav Ivanov, the Deputy Chairman of the Committee on Regional Policy, Urban Developments and Local Self-Government Aleksandar Nenkov, Lyubomir Peinovski, member of the MB of BCC, the Executive Director of BCC Eng. Miroslav Maznev, Eng. 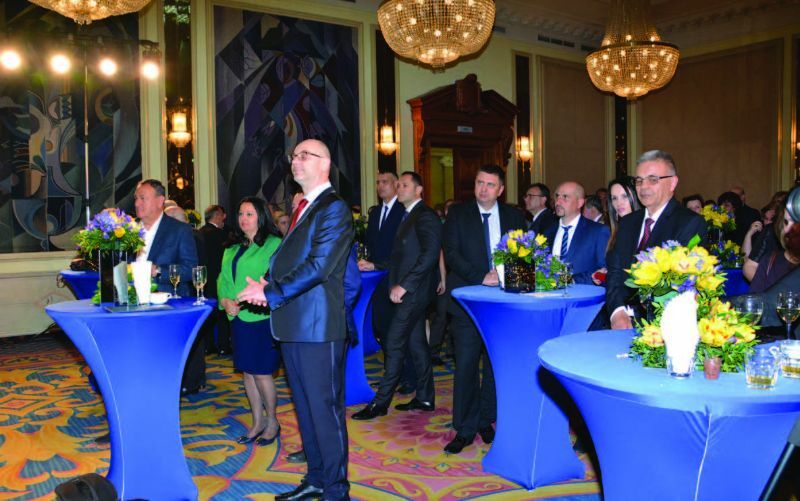 Ivan Mollov, Deputy Chairman of the RO of BCC – Sofia, members of the MB of BWA, representatives of municipalities, water supply and sewage firms and other companies. Traditionally this event got together more than 150 experts from the Water Supply and Sewerage industry. Presentations were made by Ivanka Videnova, Director of the „Water Supply and Sewerage Systems“ Directorate within the Ministry of Regional Development and Public Works (MRDPW), Dr. Eng. Dochka Vasileva, expert on „Strategic investments”– Coordination Unit, Fund of Funds, and Donka Yordanova, expert from „Rural Areas Development” Directorate within the Ministry of Agriculture, Food and Forestry (MAFF). Presentation was made as well by Anastasia Stoimenova from „Geostroy“AD, general partner of this event. She presented to the attendees projects in water supply and Sewage industry, successfully implemented by the company. „For the eighth consecutive time at the end of the calendar year we succeed to get together the business and the institutions, together to report what has been implemented until this moment under the OP „Environment” (OPE) and under the Rural Development Programme (RDP). To make a stocktaking of the complementary investments within the Water and Supply and Sewage industry, that do not fall into OPE and RDP scope as well, and also to outline everything that is to happen in the water sector in Bulgaria. All of us are aware that what expects us is a lot of work. During the several past years we had been working on preparation of large scale investments for water supply and sewerage infrastructure. The forthcoming 2019 year is a critical for the programming period and we should take action towards realization with a rapid rate. The sector wants the things to happen and we rely on that the institutions will work as this to happen in the best way. Exactly for this target of the forum we have invited representatives from the respective ministries and the Sofia municipality, which are aware about the investment process”. This was said at the opening of the conference by Eng. Ivan Ivanov, Chairman of the MB of BWA, who was also moderator of this event’s the opening panel. Eng. Ivan Ivanov read a congratulatory address from the Chair of the Parliamentary Committee on Environment and Water Ivelina Vasileva, addressed to the Chairpersons of the MB of BCC and MB of BWA and to the conference participants. „It is an exceptional pleasure for me to have the opportunity to participate in the opening of the Eighth National Conference „Operational Programme „Environment” and Rural Development Programme in the 2014 – 2020 period”, organised by the Bulgarian Construction Chamber and the Bulgarian Water Association. The forum won recognition as one of the events of most significance for the water and construction sectors, that brings together a wide range of experts – from the highest levels of the state and local powers, builders, designers, representatives of consultancy companies and importers of materials”, said Eng. Iliyan Terziev, Chairman of the MB of BCC. He underlined that the forthcoming year is a key one for the programming period 2014 – 2020, particularly for the projects under OPE. According to his words during 2019 is expected the large water projects to be launched. Eng. Terziev stated, that Bulgarian construction companies have accumulated considerable experience during the previous period, and same was done by the managing authorities of the operational programmes. „We have learned lots of lessons, like for instance that the standardized tender documentation is of exceptional importance. I must remind that the Chamber, together with the Ministry of Environment and Water and the Operational Programme „Environment” have elaborated standardized samples of documentation for the water projects under „OPE 2014 – 2020”. We hope that they will make the procedures in the Water supply and Sewage sector much easier and more transparent, and that they will contribute for the successful implementation of the important for our country upcoming projects”, pointed out Mr. Terziev and added that for the success of the programs it is necessary to finalise the water reform, and the forum has to pay attention to it. „Of course we know that the funds needed for development and management of water sector are much more than those envisaged under the European programmes. We hope, that today one of the topics, that are going to be subjects to discussions, is going to be related exactly with the strategy and the possibilities for financing the sector. I am sure that again, like until now, the conference will place the most topical problems and will outline the perspectives for sector’s development. I am convinced that the forum will be very useful for all the participants in the process of modernisation of the water sector in our country”, said in addition the Chairman of MB of BCC. „Thank you for the invitation, indeed, it is an honour and pleasure for me to be with you for another year. The improvement of the quality of life of Bulgarian citizens, while keeping the balance between preservation of the environment and economy development, is a main priority of the MoEW. That is why our efforts are oriented towards modernisation and building a new ecologic infrastructure. It is an important factor for the high quality of life of citizens”, stated the Deputy Minister Atanaska Nikolova and reminded that a basic financial tool for investments in the ecologic infrastructure is the Environment OP, where the biggest resource is foreseen in Water Sector – BGN 2,3 Billion. She underlined that during the period 2014 – 2020 a new approach is being implemented by the Operational Programme for financing the Water supply and Sewage sector: one detached water supply and sewage territory – one water supply and sewage operator – one project. „Within 2016 the Ministry of Environment and Water with the provided by OPE funding had started preparation of 14 regional pre-investment studies (RPIS). The work on elaboration of documentation for 6 of these detached territories is already finalized, including as well a standpoint of the JASPERS initiative experts. Regarding the remaining 8 RPIS, adoption of final reports is impending. Meanwhile during the summer months, the Managing Authority (MA) of OPE had published an invitation to the 14 Water Supply and Sewage operators, which are the main beneficiaries within this programming period, for submission of project proposals. The deadline for proposals accepting is 23 April 2019. In order to speed up and to facilitate the process of preparation of quality projects the MA of OPE organises periodical consultations and work meetings with the beneficiaries, intended mainly to eliminate all weak sides in the project documentation within the earliest stage, particularly – the assessment stage”, informed Mrs. Nikolova. improved”, pointed out the Deputy Minister. Mrs. Nikolova notified that the announced under OPE procedures are for 99% of the overall budget of the programme. The number of signed contracts for financial grants is 99, at a total amount of BGN 1,37 Billion, which is about 40% of the OPE resources. A double increase of payments is reported per 2018 in comparison to 2017. „From the beginning of the programme period, up to now, over BGN 400 Million is paid to the beneficiaries, which equals to 11,6% of program’s budget. The Managing Authority proceeds with the strict monitoring aimed to avoid delays in respect to reimbursement of the made by the beneficiaries expenditures”, underlined Atanaska Nikolova. 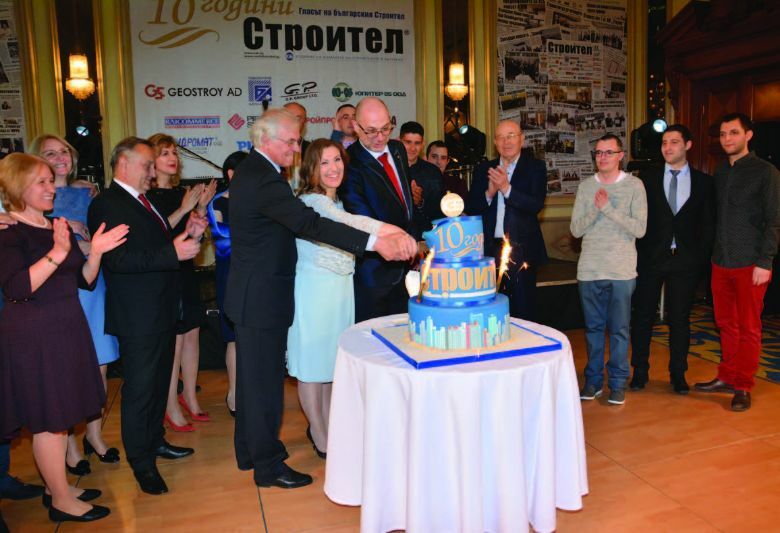 „It is a privilege for me to participate in the opening of the Eighth National Conference of the Bulgarian Construction Chamber and the Bulgarian Water Association. This initiative of BCC and BWA to carry out this forum contributes to consolidation of construction industry and all the parties concerned within the Water Supply and Sewage sector. This event has provoked the public interest, because it provides publicity of what had been achieved within the industry until now and everyone could get acquainted with this information. In the same time within the framework of this conference important for all citizens questions, issues and challenges have been posed with a purpose the correct and reasonable resolutions to be found, with a thought of the future generation and the environment”, said Dr. Lozana Vasileva, Deputy Minister of Agriculture, Foods and Forestry. She pointed out, that within the Water supply and Sewage sector development strategy per the period 2014 – 2023 the main measures for improvement of the drinking water quality are construction of purifying stations and replacement and rehabilitation of the out-worn water-supply networks, as well as that the need for investments in the Water supply and Sewage infrastructure is huge, particularly in the rural areas. Dr. Vasileva added, that during the present programming period RDP is contributing to resolution of problems in the Water supply and sewage infrastructure and to developing a financially, technically and ecologically steady water supply and sewage sector. „Within the period 2014 – 2020 over Euro 127 million have been detached for the RDP sub-measure 7.2. „Investments in the creation, improvement or expansion of all types of small scale Infrastructure”. These resources provide to the municipalities the possibility to invest in construction, reconstruction and rehabilitation of water supply and sewage networks and facilities, while the projects that get priority financing are those implemented in the settlements where it had been established poor quality of the drinking water and where the break-downs of the water supply system are frequent. Up to this moment 49 contracts for financial aid are signed with the municipalities within the State Fund Agriculture, at amount of almost EURO 125 million. The aim of these investments is to improve the quality of life by provision of better water supply and sewage services in the small settlements”, the Deputy Minister Vasileva advised of. It became clear from her statement, that the contracted funds under the Rural Development Programme within this period were 60%, or over EURO 1,6 Billion. As per 1 November 2018 the paid off resources are over EURO 680 Million. „In conclusion I would like to wish the builders to keep-on successfully working for development of our settlements, so that they continue to take on the appearance of the European ones. Undoubtedly the construction sector is the one, that had proven its steadiness during the time. I wish you success in projects implementation, and let all together collaborate for resolution of issues within the sector”, added Dr. Lozana Vasileva. „I would like to thank the „Stroitel“ Newspaper and the BCC for organizing this event and for inviting me, because the problems related to provision of enough resources for implementation of projects in the water supply and sewage network are quite big challenge for each mayor. These problems are among the most important ones per each settlement, and they are even more grave in a big town. Water supply and sewage projects are most difficult, most expensive and they always are a huge challenge for the contractors, citizens and administration. Everything that we are doing and that is in front of us, requires enormous mobilization, resource, organisation and patience of the public”, said the Mayor of Sofia Yordanka Fandakova before the participants in the conference. „In order to proceed with construction of water supply and sewage network in the regions where it is missing, we rely exceptionally on the OPE 2014 – 2020, as well as on the other possible sources, including resources from the Sofia Municipality budget. According to our calculations the funds that we could provide from different sources up to 2025 are about BGN 800 Million”, she explained. Yordanka Fandakova announced also that Sofia Municipality is about to finalise preparation of Regional Pre-investment study, which is a necessary condition for the municipality to apply for financing from OPE. The Sofia Municipal Council is to discuss and consider the list of projects soon. With the prepared RPIS Sofia Municipality will be able to apply for the maximal size of funding under OPE, which is BGN 400 Million. „We are going to do all possible to apply within the deadlines with quality projects. For the rest of funding that we need for water supply and sewage infrastructure we are going again to rely on the concessioner’s investment program, as well as on EMEPA. At the moment in Sofia a lot of projects are being implemented with the financial support of these sources in the districts of Simeonovo, Benkovski, Moderno predgradie, Gorna banya, the area of Slivnitsa in Lyulin region, Gorublyane, Ovcha kupel. We will continue to collaborate with BCC on the topics, related to time-limits, quality of implementation and capacity of companies, because the project sites always face challenges. I hope, that during the following years we will be able to implement the ambitious programme of Sofia Municipality, in order to provide cleaner environment in our town”, the Mayor of Sofia said as well.